Voyager Boutique Creative – http://www.voyager-retreats.com/: This hotel has only a few designer bungalows. Located within walking distance to the beach, bike rentals. spas, shops and restaurants. Breakfast is included with the room price. Mick’s Place – http://micksplacebali.com/: This resort only has 5 bungalows. The Honeymoon Suite has it’s own private entrance and pool. Mick’s Place sits high on a bluff overlooking the ocean (and lots of surfers). There is a stairway made of stone going to the beach. It is very steep. Along the way down you will see restaurants and home stays at budget prices. The bungalows are open air. This was one of my favorite places. The price was higher than most but it was a special place to stay. Breakfast is included in the room price. Special dinners are available every night at an additional cost. Tegal Sari Resort – http://www.tegalsari-ubud.com/en/: This resort is Balinese operated and owned. We couldn’t get a basic room because they were completely sold out. Instead we reserved the only available room which was a suite. Even though we didn’t need half of the amenities the suite offered, it was the most incredible room I’ve ever stayed in. The suite included our own full kitchen, living room and private pool. This was a “flashpacking” splurge. Most of the rooms overlooked the rice fields. We had no view in the suite because of the private entrance. Breakfast is NOT included with the room price. Cendana Resort & Spa – http://www.cendanaresort-spa.com/: We stayed here ten years ago and loved it. Since then they have expanded the property and added more rooms. We stayed in a “standard room”. The rooms are true to the Balinese cultural arts. The hand carved doors and statues are throughout the property. A spa has been added to the property also. I wasn’t crazy about the massage we got here and the prices are very high considering the options around town. The location is central to restaurants and Monkey Forest . Breakfast is included in the room price. Aditya’s Home Stay – http://www.adityahomestay.com/home : This was our first budget place. There are many “home stays” to stay overnight at in Munduk. This place was highly rated on TripAdvisor. The family lives on the property and has built several rooms to accommodate guest staying overnight. The rooms are not luxurious but they are comfortable and the prices are extremely low. There is a restaurant on the property and breakfast is included in the room price. Kebun Wayan Hotel (a.k.a Cafe Amed): This hotel was close to many restaurants and shops. The hotel was separated into two sections. The rooms on the lobby side didn’t have a view, however they were closer to the pool area. The other section was across the main road on the ocean side. We stayed in an upgraded room called the Puri Agung View room. This room overlooked the spa and had a side view of the ocean. The amenities were hot water, air conditioning and a mini bar (refrigerator). There was a large open air common area on each floor. The common area on the top floor overlooks the ocean. These rooms on the ocean side are closer to the restaurant. The room was beautiful and spacious. Breakfast is included in the room price. Scallywags Resort– http://scallywagsresort.com/: This is another higher end property. The location is on the beach and the rooms have private entrances with a patio area and outdoor bathroom. 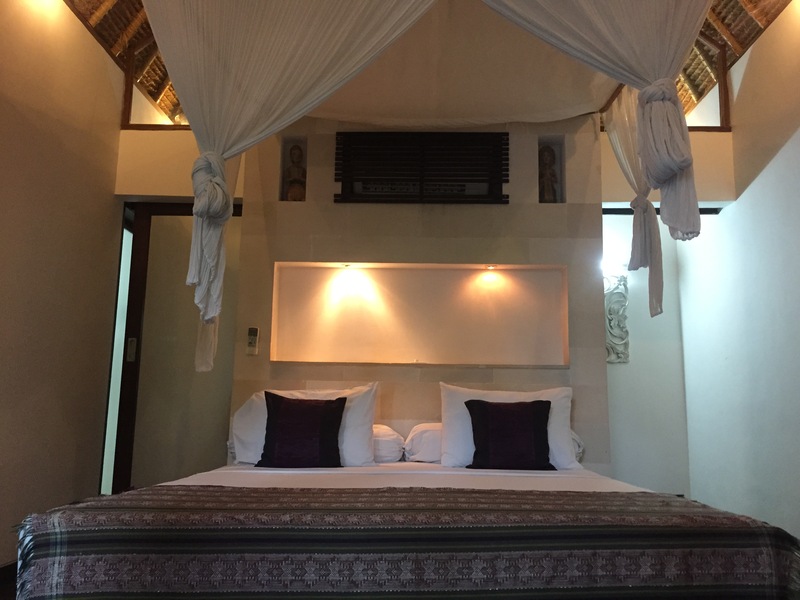 The owners are European with a Balinese partner so there are many “western” comforts included in each room (cable tv, faster wireless, DVD player, air conditioning and refrigerator). The restaurant is very popular and they have 2 sister properties on Gili Air Island. Breakfast buffet included in the room price. Smugglers Hideaway: http://scallywagsresort.com/room-list-air/: This is a sister property of Scallywags Resort. The rooms are very similar to Scallywags. The location is a 7 minute walk to the beach and restaurant. Access to the Scallywags Beach Club is included with the price of the room. This is a huge advantage. All of the “western” comforts are included (cable tv, DVD player, air conditioning, hot water, privacy, room safe and refrigerator). An extensive breakfast buffet is included in the room rate. Hotel Pearl: http://www.balihotelpearl.com/: This is a mid range budget hotel. There are upgraded rooms available for additional charges. The standard room was just that. Included in the standard room is a safe, DVD player, air conditioning and private patio area. Breakfast is included. The property is small and beautiful. A 5 star French restaurant is attached to the property and French cooking classes are offered once a week (990,000.00 rupiah). DVD’s are available to watch in the room at the front desk for no charge. Villa Cha Cha Hotel: This is a budget hotel located one block from the famous Khao San Road. We chose this because of the location for the first 3 nights in Bangkok. The hotel is charming and comfortable. The room overlooked the pool. The amenities offered in the room were hot water, air conditioning, room safe and refrigerator. The room key is required to turn on the electricity. Breakfast is not included in the room price. Sukhumvit Suites: http://www.ssukhumvitsuites.com/: The location is key to this hotel. The sky train entrance is outside of the front door. The superior room is very small but comfortable. This hotel offers free wifi, room safe, refrigerator, laundry services and a high end restaurant on property. Breakfast is not included in the room price. Vieng Lanna Mantra: http://www.viengmantra.com/: This is a small charming boutique hotel. The upgraded rooms are facing into each other, which was uncomfortable with the curtains open. The standard rooms have more privacy. The location is across from the market which is wonderful for eating and shopping. There is also a postal office across the street which helps for sending packages back to your hometown easier. There is also a really good local restaurant directly across from the hotel called Lert Ross. They specialize in a grilled fish that is out of this world. The room included a refrigerator, DVD player, safe, air conditioner and patio. A breakfast buffet was included in the room price. Pai Village Boutique Resort & Farm: Each room is an individual bungalow. Each bungalow includes a tv, safe (small;doesn’t fit a 13″ Mac computer), air conditioner, mosquito net over bed and patio. The key is used to power the room lights and air conditioning.The location is right off the main drag and very close to the river. The property is upscale compared to the other’s in the area. Complimentary ride and entrance fee is offered to hotel guest to visit the Pai Village Farm. Complimentary shuttle to the airport. Breakfast buffet is included in the room rate. Chaba Hotel: This budget room was set up as a condo/hotel. Small kitchenette with stove top, counter space and cabinets. The bedroom area was larger with an outdoor small patio overlooking the smaller of 2 pools on the property. The amenities included a refrigerator, safe, TV and air conditioning. The key is used to power the room lights and air conditioning. Karon beach is a 10 minute walk from the property. Breakfast is not included in the room rate. Better View Bed & Breakfast: This is a lush resort with stunning views of the ocean and karst. Each room is a private bungalow with a large patio area. The property has an infinity pool, restaurant and lounge chairs in the grass by the ocean. Swimming is only at high tide. After around 3pm the tide went far out. Each bungalow includes a safe, refrigerator, jacuzzi tub, air conditioning and cable tv. Tour bookings and motorbike rental is available at the property. Breakfast is included with the room rate. Ban Sainai Resort: This lush spacious property is inland from the main town and beach. The hotel offers complimentary shuttle service to and from town from 9am-10pm daily. The grounds are beautiful with stunning views of the karst. The restaurant sits over a small pond with begging fish to feed during each meal. Each room is an individual bungalow with a spacious patio. There is a large infinity pool with a restaurant area to order food and a pool bar. Each bungalow includes a safe, refrigerator, complimentary bottled water, air conditioning, cable tv, laundry services and hot water. A breakfast buffet and ala cart menu for breakfast is included in the room price. Rambutan Boutique Resort – This boutique resort is part of 2 other properties close by. The Rambutan is a very small hotel located over the bridge from the main drag of town. The rooms are charming with patios overlooking the pool. Each room includes a safe, refrigerator, air conditioning, fan, cable and hot water. The Red Lantern restaurant is part of the property and serves gourmet Cambodian and western food. The resort offers concierge services and transportation arrangements throughout town. This is a gay friendly resort. One free 30 minute foot massage and daily breakfast is included in the room rate. King Rock Boutique Hotel: This is a new hotel in Siem Reap. The rooms are small but very comfortable. The property has a restaurant and pool. Free one way airport transportation is included with a room reservation. Complimentary transportation to town is provided. Each room has a safe, refrigerator, air conditioning, patio and tv. Breakfast is included in the price of the room. Battambang Resort: This is beautiful resort away from town. Rooms are surrounded by lush gardens and the lake view rooms are facing a beautiful pond. There is a large pool and restaurant on the property. European and Khmer food is served at the restaurant. Each room includes: kitchenette, safe, locked closet, phone, tv, refrigerator, air conditioner and spacious patio with ceiling fan. Breakfast is included in the price of the room. Secret Garden Resort: Small property with bungalow style rooms. Very basic rooms but spacious. The beach is directly across the street with private lounge chairs and umbrellas for guest. There is a large swimming pool on the property. The restaurant is the best and highly rated on in the area. The room includes: air conditioning, outdoor shower, cable tv, DVD player, standing fan, refrigerator and locked box safe under the bed. A patio deck surrounded by plants is outside. Breakfast is included in the price of the room. Tamu Resort: Very modern, beautiful and spacious room. The beach is directly across from the property with comfortable private beach lounge chairs and plush beach mattresses with large pillows. The beach towels are extra large and plush. The rooms surround a narrow pool. Beach sand is used around the property instead of cement. The room includes: refrigerator, in room safe, mosquito coils, racket and spray, spacious outdoor bathroom and shower, quality linens, tv, DVD player, air conditioner and ceiling fan. Paradise Bungalows: This property could use a huge facelift. The bungalow rooms are located on the beach but there are no comforts in any of them. The stone bungalow has air conditioning and a sealed door with a spacious patio area. There is no electricity from 6am-6pm and no hot water at anytime. The bathroom is outdoors with very low lighting. The room itself was very small, leaving only enough room to get in and out of bed. The room included a bed and 2 small towels. No maid service is offered. On a high note, the restaurant serves the best food on the island. This is the best accommodations on the island. Rikitikitavi Resort: European owned small boutique resort right on the riverfront in Kampot. The rooms are well lit and spacious. The restaurant is also highly rated serving Western and Asian food using fresh and imported ingredients. The room included tv, refrigerator, in room safe, tv, DVD player, hot water and patio. DVD library has over 100 updated movies and tv series for complimentary use during your stay. Breakfast is included in the room price. Villa Vedici: Spacious property with rooms and large bungalow rooms. Built next to the river on beautiful gardens. The hotel offers kayak, wind surfing and kite board rentals. Sunset cruises down the river can be arranged. The downstairs bungalow we rented was spacious. More attention needs to be paid to detail to make this property a spectacular getaway. The property has many amenities: pool table, tv/movie room, outdoor pool, river patio to chill, restaurant and bar, free wifi, weight room, ping pong table, trampoline and dvd collection. The room included: tv/dvd player, refrigerator,air conditioner, wood box safe w/key, hot water and patio. The Pavilion Hotel: Beautiful, private and serene property. Built in the 1920s and restored into a classy and charming hotel. Each room is different with private entrances. Two outdoor pools, weight room, spa and restaurant on property made the stay comfortable. Room included: tv/dvd player, cable tv, refrigerator, safe,air conditioner, free wifi and hot water. Breakfast was included with the room price. A 25 minute complimentary massage at the Pavilion Spa is issued upon check in per guest. Complimentary bottled water. 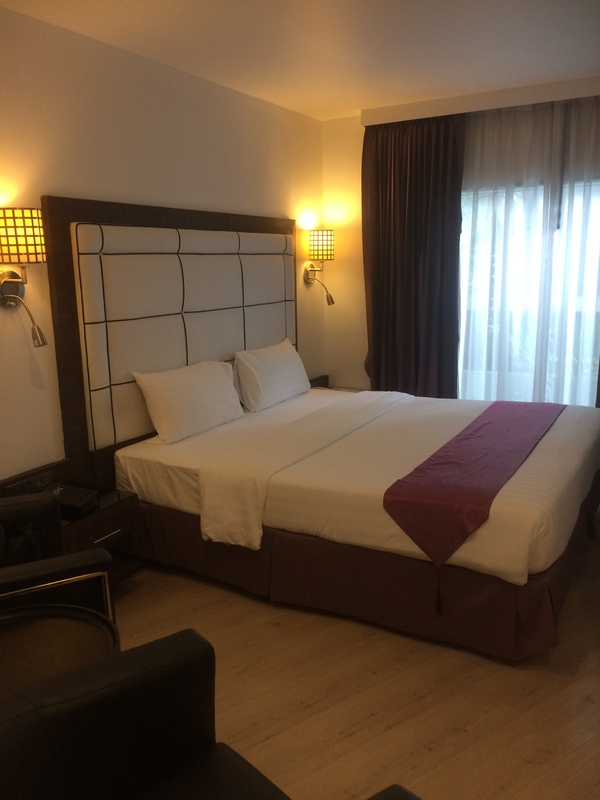 Bliss Hotel: Located in Chinatown and directly across the street from the MRT Station. This hotel was in a great location. The rooms are very small but comfortable. The room included: cable tv (limited channels), refrigerator, in room safe, hot water and air conditioner. Courtyard @ Heeren Boutique Hotel: Located in the heart of historical Georgetown and close to all the restaurants and shops. The location of this hotel gave us access to all of the historical landmarks by foot. The rooms were spacious and comfortable. The only downside is there were no windows in the rooms that had direct access to sunlight. The hotel was a mix of antique and modern giving it a boutique feel. The key worked as the electricity to the room. The room included: limited cable tv, refrigerator, electric room safe, hot water, air conditioning, complimentary buffet breakfast & free wifi. Anggun Boutique Hotel: Located in the Bintang area of Kuala Lumpur. Very close to restaurants, malls, hop on bus and the monorail. The room was clean and the property was kept up. We upgraded to the superior room which included a desk and a few inches more space. The hotel has a small spa on the property but it’s very limited. The key worked as the electricity to the room. The room included: limited cable tv, refrigerator, electric room safe, hot water, air conditioner, complimentary breakfast & free wifi. Aloft Hotel: Located in central downtown Kuala Lumpur attached to the Nu Sentral mall and Central Station. This hotel caters to business travelers and is operated by Starwood properties. This hotel has all the amenities that make a place super comfortable to stay in. Each room was spacious, high speed internet, in room safe, cable tv, refrigerator, robes and high thread count sheets. Great restaurants, state of the art gym, rooftop infinity pool and room service are some of the properties amenities. We stayed in the “urban room”. Hotel Penaga: This hotel includes 3 restored historical buildings in the Georgetown area of Penang. The property includes a pool and botanical garden. The Transfer Suite was spacious and two stories. This suite came with a downstairs sitting room with kitchenette, an outdoor Jacuzzi and an outdoor sitting area. The master bedroom had a double shower and patio terrace. The second large bedroom has a large bathroom attached. This suite could easily sleep four people. We chose this room because we had a guest staying with us. Complimentary wifi, in room safe, air conditioner, and dvd player were included. Breakfast buffet is an additional cost to the room rate. $165.00 (USD). Sunset Valley Holiday Houses: This is a beautiful spacious private property. There are 5 original Malaysian houses that were brought here and rebuilt with a bathroom added. They are beautiful. Each house has a kitchenette, bed, sitting area, large outdoor porch, ceiling fans and dining area. We stayed in the Garden House. Ten Moons Lipe Resort: Located in a private cove this resort has it’s own private beach area. The hotel has been open less than a year and the grand view rooms are spacious and new. We stayed in a beach front room the first 3 nights. The beachfront room was small but only steps away from the beach and faced the sunrise. The bathroom seemed dated but the location was great. Moving to the grand view room for 3 nights was much better. Still close to the beach but the room was spacious and updated. The price was higher for the beachfront room surprisingly. The restaurant served both Thai and Western dishes. Both were superb. Breakfast is included in the room price and ordered ala cart from a menu with many choices. Refrigerator, complimentary water, in room safe,and limited cable tv (nothing in English), were included in each room. Complimentary use of snorkels, fins and floats and beach toys are provided by the hotel. Very friendly service from all areas on the property. Hotel Esperado: Located directly across from Kandawgyi Nature Park, the views are spectacular. This high rise hotel is comfortable, clean and located centrally from temples, restaurants and sight seeing. The room included a refrigerator, in room safe, hot water, complimentary breakfast buffet and turn down service. There is a gym, room service and rooftop restaurant on the property. Clover City Center Plus: Located in the heart of the city. This hotel was walking distance to many restaurants and shops. However, the hotel was a bit plain and needed attention in certain areas. The sheets and pillow cases weren’t comfortable and the room was bare walls. The room included a refrigerator, in room safe (not nailed down), air conditioning, limited cable tv, hot water. The shower is in the toilet area causing the whole bathroom to be wet. Breakfast is not included in the room price ($10.00 USD per person). Zfreeti Hotel: Located in Nyaung-U and very close to all of the temples. The entire property is updated and walking distance to “restaurant row”. The deluxe room included a refrigerator, air conditioner, room safe, hot water and cable tv (HBO). Laundry service is available. The hotel has a restaurant (cash only) that serves all meals. Breakfast (buffet) is included in the room price. Hotel Brillant: This hotel is 2 kilometers away from the main part of town. Bikes are provided at no cost to ride into town. The hotel mimics individual homes. Each room has a separate walkway, private entrance and patio. The room included a refrigerator, limited tv stations, hot water and air conditioning. Breakfast is included in the room price. Laundry service is available. Tour and travel arrangements can be made at the front desk. Hotel Amazing: Located on the main road, this is one of the highest end properties in the area. The room is spacious with a private balcony. The interior is wood with Burmese artwork. The room includes in room safe, refrigerator, hot water (hardly any cold water), large sunken bathtub/shower, free wifi (bad signal), phone in room, coffee & tea and telephone. Laundry services are offered for an additional fee. Breakfast is included in the room price. Cassiopeia Hotel: Located on the main road. This hotel is small, clean, efficient and comfortable. This property was half the price of the Hotel Amazing and the same quality. The room has a private entrance and patio. The room includes: in room safe, hot water, air conditioner, phone in room, cable tv (limited), refrigerator, toiletry amenities, bathtub, separate shower, coffee & tea. Laundry services available and complimentary use of bikes. Breakfast is included in the room rate. Thande Beach Hotel: Located right on the beach. This is an upscale hotel with rooms on the beachfront and rooms without a view. The prices vary. It’s very difficult to get a reservation here. The room we stayed in was towards the back of the hotel but only steps away from the beach. The room we stayed in included: in room safe, free wifi (not a very strong signal in the rooms), refrigerator, telephone, patio, limited cable and hot water. The resort had a beautiful restaurant on the beach. Unlimited beach towels and lounge chairs w/ umbrellas were supplied for the guest. A large breakfast buffet from 7am-10am is included in the room price. Free airport transfer. Rivertop Lodge: Located across the street from the beach. The hotel provides beach towels and chairs on the beach for guest. Each room is spacious with a private entrance. The room includes: a desk, sitting area, private patio, in room safe, refrigerator, free wifi and hot water. Breakfast buffet from 7am-9am is included in room price. Villa Caemilla Beach Boutique Hotel: Located right on the beach, this resort is brand new. The hotel received an World Luxury Hotel award. The rooms are so comfortable and each room included: refrigerator, safe, cable tv, air conditioning, free wifi & robes. The restaurant on property has beach dining, room service and a full restaurant. The food is really good. A private section on the beach is provided for guest with lounge chairs, towels, umbrellas, complimentary bottled water and wet face towels. At sunset, limited complimentary hors-d’oeuvres were passed around on the beach. This resort is located in station 3 on White Beach. Station 3 is less crowded and much quieter than stations 2 & 3. Sea Cocoon Hotel: Located in the heart of El Nido, close to restaurants, beach and shopping outlets. This hotel is the newest and most modernized in town with a swimming pool on property. Each room includes: air conditioning, in room safe, balcony, hot water, free wifi and cable tv. Transportation and tours can be arranged on property at the same rates of the tour companies outside of the hotel. Complimentary breakfast is included in the room price. Radisson Blu Hotel: The most luxurios hotel in Cebu. The property and inside is beautiful. The hotel has a huge swimming pool, gym with option for a private trainer ($10/hr USD), business center, ballroom, nightly live music in the lobby and two nice restaurants. The room was spacious and included: complimentary high speed internet, refrigerator, robes. large bathroom, phone, air conditioner, and cable tv. The room price included a HUGE breakfast buffet that featured over 50 dishes. The property is directly across the street from the SM mall. The mall has many restaurants and brand name stores. Coco Grove Beach Resort: This is a privately owned massive resort built along the beach. Surrounded by a huge wall from the street, everything you could possibly need is on the property. 3 swimming pools, 3 restaurants, gym, dive shop, spa, 2 gift shops, nightly live entertainment, tour desk and a business center. Complimentary use of kayaks and two private docks in the ocean to swim, snorkel or row to. Plenty of beach chairs, huts and tables for everyone and very spread out. The rooms were comfortable with over 25 different types of rooms spread out in several areas on property. We stayed in Casa Coco by the front desk. The room had a private balcony, refrigerator, safe, air conditioning and complimentary breakfast. This is the only resort hotel on the island aside from hotels and guest houses. Villa Laodeum Nam Khan View: This is a beautiful wooden guesthouse with about 8 rooms. We stayed in room 1 on the first floor. There wasn’t much privacy due to our patio also being the breakfast area and common sitting area to enjoy the river view across the street. The room was nice with a home feeling and French influences in the decor. The room included a refrigerator, tv with limited cable, patio area, air conditioning & complimentary breakfast from 7-10am. Buri Rasa Resort: This luxury hotel is right on the beach. The resort is all inclusive with a spa, restaurant, shops and gym. The spa offers happy hour pricing for Thai massages and resort guest receive 20% off restaurant and spa charges (happy hour doesn’t apply). Free classes are offered daily for various things (ex: Thai dancing, head massage, towel folding, watercolor painting, etc). The restaurant has a nightly bbq on the beach and live entertainment. The room is beautiful and spacious. Our room included: limited cable tv, in room safe, patio area, DVD player and refrigerator. There are lounge chairs, towels and food and drink service on the beach along with a swimming pool on property. Zazen Boutique Resort & Spa: This privately owned beautiful resort is on Bophut beach. Although the beach area was small and boats were parked along the shore, the resort was stunning. The resort has a high end spa, gift shop and restaurant that offers high tea upstairs daily. A swimming pool and a huge coy pond are on property. The complimentary breakfast was gourmet and open aired by the ocean. The room included refrigerator, in room safe, robes, slippers, use of a beach bag and sun hat, cable tv, DVD player (with library of DVD’s to use), air conditioning, outdoor bathroom, couch and patio area. Breakfast was included daily from 7-10am. 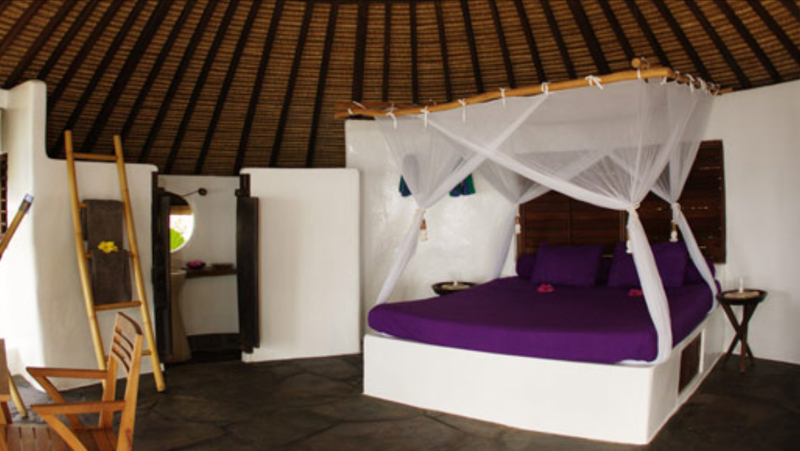 King’s Garden Resort: This beachfront resort is broken up in individual villa style rooms. Each room has its own private entrance, patio, limited cable tv, in room safe, air conditioning, fan, DVD player, refrigerator & beach mats (for the beach chairs on the beach.). Complimentary breakfast is included in the room price from 7am-11am. Amsterdam Air B&B: This apartment is located in an upscale residential area close to everything. The apartment has all the amenities of being at home. Priced on the higher end, we loved the space and living like a local resident. Within walking distance to Anne Frank’s house. Barcelona Air b&b: Located in the Gracia area, this residential area is quiet and close to public transportation, restaurants and a couple of Gaudi buildings. Although it was short on amenities, the location was superb. Very clean and new with a huge outdoor rooftop private terrace patio. Lisbon Air b&b: Located in the Chiado area, this residential apartment is close to public transportation, shopping and restaurants. The apartment had basic amenities and in a very safe area of town. Cascais Portugal Air b&b: This spacious apartment is in a residential area within walking distance from the beach and restaurants. This apartment was clean with all the amenities of home. This Air b&b is run by a family business that has the best service we have experienced through air b&b including pick up service. This family owns and operates many upscale contemporary apartments through their company onhostportugal.com. Tel Aviv Air b&b – This was the most beautiful apartment we have stayed in during our travels. Located one block from the beach and a 5 minute walk to the famous Carmen Market. This residential building is quiet and upscale. All of the furniture and amenities were luxurious. This was our favorite place so far. Jerusalem Air b&b – This small efficiency apartment was located in the center of town. Across the street from the mahane yehuda market, metro and walking distance to the old city. The apartment is in a residential area with a private entrance. A kitchen, refridgerator, comfortable bed, internet, cable tv, bathroom and separate shower. The owners live next door. Surfers Paradise Air b&b – This modern plush apartment is directly across the street from Surfers Paradise beach. The building is mixed with condos and businesses. A gym and security company shares the same floor as this 2nd floor aparment. The kitchen is equipped with the very bare bone basics. A washing machine, cable tv, internet, parking garage (and space), pool and gym access and a spacious outdoor patio are the highlights. The only downside is the location is also across the street from a nightclub. The noise is loud at night until very late hours. We could make out the words of the songs being played at times. $175/nt. Carlton Air b&b – This apartment was in the upscale area of Carlton. It was private, quiet, bright and clean. The kitchen was clean and well equipped. The apartment was right across the street from the train and bus. One bedroom/bathroom with everything but a washer and dryer (coin laundry is one floor down). Motel 429 – Clean motel right across the street from the water. The location is off of a main street but minutes from downtown. Room included; cable tv, refrigerator, hotpot, internet and phone. Nomads Queenstown – We stayed in a private room wtih a balcolny. Community kitchen and lounge area. Free internet between 8am-8pm (after 8pm internet is $4.00 (NZD)). The room has hot water pot, refrigerator, balcony, desk and tv with limited channels. Te Anau Holiday Houses McKerrow Cottage – Beautiful full house decorated in old Te Anau style. The location was walking distance to the lake and central to town. Only one hour from Milford Sound. Wanaka Luxury Apartments – soft lounge chairs, cable TV, DVD player, fireplace, granite-topped kitchenette, spa bath and private patio and driveway. One bedroom apartment. Haast River Top 10 Holiday Park – Stayed in a private hotel style room with a kitchenette and balcolny. Cable tv and internet included. 58 On Cron Motel – Clean and comfortable apartment. Kitchenette, cable tv, internet and parking all included. Global Village – Immaculate backpacker hostel with all amenities of home. We stayed in a private room that included free interent. The communal kitchen and common areas were clean, bright and well stocked with games, computers, instruments, books and magazines. Close to shopping and the ocean. Free internet until 8pm. Ocean View apartment Air bnb – Beautiful first floor apartment across the street from the ocean. free wifi, TV, large lounge, full kitchen, bathroom, parking garage and close to restaurants. The only complaint is the noise from the busy road when the windows were open. Hat Trick Lodge – This is a hostel/backpacker hotel with a spotless shared kitchen. We booked a private room w/ a private bathroom and that made it a perfect place to stay. The whole place is spotless and it was fun to meet other travelers. There were plenty of outdoor seating areas set up along with a tv room to relax in. The owner also books tours and there is a coin laundry room. Internet is at an additional charge. Tata Beach Air bnb – This is an apartment with a private entrance attached to the owner’s main house. Apartment incuded breakfast (homemade yogurt and musieli, bread, fresh fruit juice, fresh dairy milk (non processed), assorted cereals and homemade jams. ), bbq grill, cable tv, internet, access to the owner’s garden and fruit trees, washing machine and homemade roasted coffee. Tata Beach is directly across the street. Downtown apartment Air bnb – This downtown apartment included fully equipped kitchen, washing machine/dryer, flat screen TV & DVD, free unlimited wifi and parking garage. Onsite air conditioned gym and sauna. The view is a beautiful park. City Stays Air bnb – Fully self contained apartment, full kitchen and laundry. Two bedrooms with an outside deck and a grassed area to relax on. The Retreat – Cabins built in the mountain with an spectacular view of the ocean. The cabin had two bedrooms, a kitchen and living room. Bow Street Studios – Fully equipped aparments with an upstairs bedroom at the shore of the ocean. Fast internet, kitchen, cable tv and free parking. Tatahi Lodge – The villa was a small home equipped with state of the art kitchen, cable tv, 1G complimentary internet upon check in, bbq grill, washing machine and 3 minute walk to the beach. Baileys at the Beach – studio apartment with new kitchen and direct view of the ocean. Airbnb – Beautiful apartment in Tahiti with views of the ocean and the island of Moorea. Hotel Tiare Tahiti – Room features a private bathroom, air conditioning, telephone, digital television and Wi-Fi Internet access. Faretai Love – This apartment has a large covered terrace with views of the mountains. Free WiFi and airport transfers. Rande’s Shack – The property is beautifully landscaped and fenced in for extra privacy and a feeling of complete protection. Rande has thought of everything. Complimentary bikes, snorkels, fins, kayaks and most of all clean and well equipped guesthouses. The property is only a five minute bike ride from the main part of town and minutes from the airport. Moorea Sunset Beach – fully equipped kitchen, a lounge area with sofa bed, a bathroom with separate toilet and a large air-conditioned room with quality bedding. A spacious terrace furnished with a dining table, 6 chairs and 2 sun loungers. Airbnb – Spacious 1 bedroom apart. Full size bathroom with separate bath and shower. Reverse cycle air conditioning, balcony, gym, sauna and pool. J Residences – large bedroom, open living and dining room with a mountain facing balcony, electric stove, microwave oven, fridge and ground floor concierge in a luxury building. Chi Residences 279 – Kitchen, Plasma TVs, home theatre system, wireless internet access, smart phone, air purifier and separate bedroom. Icon 56 Apartment Building – queen-sized bed, Egyptian cotton linens, a kitchenette with a dining table, cable tv, wireless internet, balcony, secured upscale building, pool, gym, washing machine and dryer. Airbnb in City Center – 102-meter apartment with 2 spacious bedrooms, 1 huge living room, 1 large kitchen, plus a balcony. Van Phat Riverside Hotel – Large spacious room, air conditioning, cable tv, hot water, refrigerator, complimentary breakfast and restaurant on property. Victoria Can Tho Resort – Luxury hotel featuring spacious room, cable tv, in room safe, balcony, complimentary boat shuttle service, complimentary five star breakfast buffet, resident water buffalo (Bravo), concierge services, pool, gym, spa and high speed wireless internet. Essence d’Orient Hotel & Spa – Queen bed, Air-conditioning, flat screen tv w/ cable, electronic safe, refrigerator, balcony and rain shower head. Tam Coc Garden Resort – Luxury hotel featuring botanical gardens, spacious room with private balcony overlooking rice fields and karst, pool, in room safe, refrigerator and complimentary breakfast ala cart. 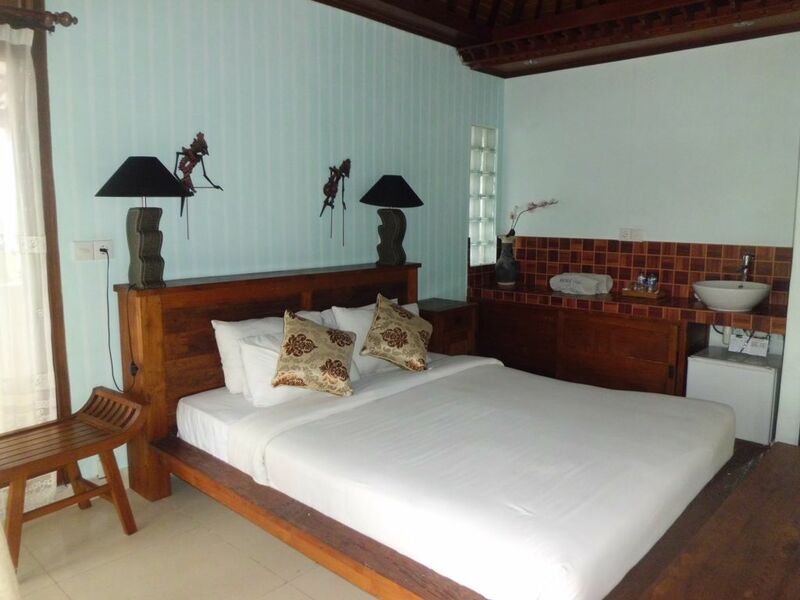 Hoi An Chic Hotel Resort – room with private veranda with the view of rice fields included refrigerator, safe, complimentary breakfast, free wifi, cable tv, transportation into town and beach and laundry services. Airbnb Downtown – Large one bedroom apartment with view of the canals centrally located downtown Rotterdam. Sandymount Hotel – Room features an ensuite bathroom, plasma TV and DD telephone. There is also an iron & ironing board, hairdryer, tea & coffee making facilities and bedroom safe. Airbnb – Living room, Smart TV / cable service and high speed Wi Fi & open air courtyard. Centrally located in Galway. Airbnb – Two bedroom apartment with fully equipped kitchen, washer, dryer, wifi and cable tv. Airbnb Wild Dolphin Lodge – Upstairs. Three bedroom, two bathroom apartment with full kitchen, wifi, cable tv & private entrance. The Hideout Hostel – A room with a bathroom in a hostel that looks exactly like the inside of a home. The community kitchen is downstairs and a sitting area. Only downside is there is no television or entertainment in the sitting area. Airbnb – Three bedroom house with fully equipped kitchen, backyard, cable tv, wifi, washer/dryer and private driveway. Airbnb Central Amsterdam – One bedroom upstairs apartment w/ fully equipped kitchen, cable tv, wifi & spacious balcony terrace. Located in the famous Javastraat. Airbnb Hyde Condominiums – One bedroom apartment with limited cable tv, wifi, high-rise building w/ guard, elevator, pool and small balcony. Shinjuku: Airbnb Shinjuku – Small one bedroom efficiency apartment with refrigerator, hotplate, bathroom, pocket wifi & balcony. Shimokitazawa: Airbnb Shimokitazawa – One bedroom apartment with kitchen, pocket wifi, washer/dryer and balcony. Airbnb – Spacious efficiency with pocket wifi, kitchen, washer/dryer and secured building. Airbnb – Very spacious apartment in a high-rise building. Amenities included: free wifi, pocket wifi when leaving the house, secured locked building, washer/dryer, full kitchen, cable tv (limited), air conditioning units, huge bathroom, private shower area, large entry way area and very close to grocery stores and tourist areas of Osaka. Airbnb Apartment 305 – The apartment was across the street from the famous garden “Kenrokuen. Very small apartment with two beds and a separate living room. Very basic amenities and no bathroom sink. Great location but a bus ride to the train station. TV, wifi, small kitchenette area and air conditioning. Close walk to the market and rental bike station. Takayama Ouan – Free Internet (LAN cable) available at guest rooms. Free WiFi at the hotel lobby. The tatami- flooring guest rooms equip a Western-style bed, cable TV, refrigerator, tea pot and a private bath (with shower and bath amenities). Airbnb-Ebisu – One bedroom apartment/studio with washer/dryer, tv, pocket wifi, air conditioning and secure building. Close to Ebisu Station and airport transportation (Westin – next door). Best Western Kennedy Drive Motel – Close to the Gold Coast airport. Very clean, comfortable hotel room with cable, wifi, refrigerator, air conditioning and parking. Newly renovated and reasonably priced.